Even though it’s on the coast, Myrtle Beach has numerous swimming pools for the millions of people who visit each year. Many private residents also have their own pools, as do 100s of residential neighborhoods. No matter where they’re located, a swimming pool can be a great way to beat the summer heat, get some exercise, or just relax in the sun nearby. But pools can be a source of danger for the unwary, too, especially for children. It’s time to get the facts about swimming pool injuries, their causes, and what to do if you or someone you know is hurt or killed in a pool-related accident. The Centers for Disease Control and Prevention (CDC) keeps figures on drowning and other water-related injuries. The CDC’s figures for the period between 2005 and 2014 show that there was an astonishing average of 10 deaths per day during that time period due to drowning. That’s an average of 3,536 people per year. While many children safely enjoy the pool every year, they are also particularly at risk for drowning. One in five drowning victims from 2005-2014 were age 14 or under, and the youngest children, ages one to four, were most likely to drown. In fact, drowning is the number one cause of death for children in the one to four age range, second only to deaths caused by birth defects. And for every child drowning death, five further children were sent to the emergency room for underwater submersion injuries. The number one location for pool accidents is in a home swimming pool, according to data from poolsafety.gov. Over 47 percent of swimming pool injuries occur in a residential pool, whether it’s the family pool or the pool of a neighbor or a friend. A further 27 percent of injuries happen at public pools, including spas and apartment complexes, and the remainder of injuries happened at locations not otherwise reported. In-ground pools account for nearly 60 percent of pool-related deaths, while above-ground or portable pools account for about 26 percent. Slip and fall injuries are extremely common on wet surfaces near swimming pools, and can result in broken arms, legs, or even life-threatening head trauma. Bruises or lacerations are possible, too. Diving injuries can happen when the pool’s depth isn’t adequately marked or the water level is lower than usual, causing the body to strike the pool floor. This can cause strains, sprains, broken bones, fractured skulls, and shattered vertebrae. 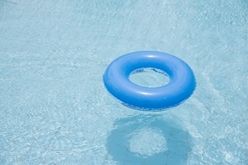 Reactions to pool chemicals are a risk when a pool hasn’t been maintained properly. The chemicals that keep pools safe from harmful bacteria are meant to be diluted, and too much can cause skin irritation (or even chemical burns, in cases of direct contact), sore, painful eyes, and difficulty breathing, as the fumes can severely irritate the lungs. If you’ve suffered an injury at a swimming pool, it’s important that you begin the legal process right away in order to have the best chance to receive compensation in a court of law. Generally, South Carolina law dictates that there is a three-year time limit on these types of personal injury claims, but if it’s a public pool owned by the government, the time limit is reduced to only two years. The sooner that you begin the process, the easier it will be to prove the conditions that may be necessary to win your case. If you’d like legal help with your swimming pool injury claim, the attorneys at the Law Office of Kenneth Berger are here to support you in your time of need. To discuss any aspect of a potential case with lawyers who pride themselves not only on legal knowledge but on treating clients like family, call us today at 843-800-0911. We proudly serve South Carolina's residents and tourists, and have experience with complex cases in the Myrtle Beach area.